Happy Saturday and second day of February! FINALLY. Can you believe the Fyre Festival documentaries came out just two weeks ago? Or that Timothée Chalamet broke the internet with his harness just three weeks ago? My, time sure does drag when it's January. Shout out to Black History Month because it's important to recognize. It has also never been more imperative that white people educate themselves on why this month exists. For my personal education, I'm going to spend February reading books exclusively by black authors; most likely works by James Baldwin, Zadie Smith, bell hooks, and Toni Morrison. I encourage you to do the same or something similar. If you haven't yet, now is the time to educate yourself on #blacklivesmatter, how black culture influences pop culture, and what you can do to be an ally in these "racially charged" (read: racist, because that's what they are) times. This year I'm trying to use this newsletter as a source of healing and reflection, like a journal or diary, with the articles I recommend providing some insight into that, hopefully. This week I don't really have a lot to talk about. I've just been taking care of myself. I've taken baths, I've finished reading books, I spent two whole days just reading on the internet. I've meal prepped salads and eaten kale. I went to the opera (I love the opera) before enduring the polar vortex in my favorite pajamas and new fuzzy blanket. I don't really have anything to say. I'm really enjoying being this relaxed. My shoulders aren't touching my ears. I'm sleeping well. My mind is active (though my body is not). I'm learning things. I'm really enjoying my alone time and haven't fucked with a dating app all week. 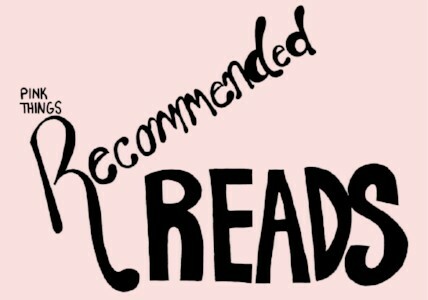 In other non-personal news, next week we're going to have a guest editor on this Recommended Reads newsletter. I'm really excited for it and hope that it will be a great resource for you next weekend. Psst. This is a new newsletter, joining the race of amazing newsletters everywhere (my favorites are GNI, Ann Friedman Weekly, and the NYT's Gender Letter). It would be super awesome of you were to share it with a friend and get them to subscribe as well. Then I might be able to lure sure cool brands to our platform and finally pay myself (and Malaika) for all of this amazing pink work I (we) do <3 Thanks in advance!